With the cooperation of our team of skilled and dedicated professionals, we have emerged as one of the leading manufacturers and exporters of Brass Low Pressure Connectors. These connectors are used in connecting burner pigtails with cylinders and valves. The connectors are made from using high quality brass, which we procure from the reliable and authentic vendors. We can make the Brass Low Pressure Connectorsavailable for the clients in different sizes and finishing as per their requirements. Type : Two Way, Three Way & Four Way. We are offering a qualitative gamut of High Pressure Connectors that are made available in different shapes as well as sizes. In order to manufacture these connectors in compliance with set market norms, our adroit professionals use superlative quality metal and progressive techniques. Our offered connectors are ideal for installation in high pressure pipelines of several commercial as well as industrial appliances. In addition to this, clients can purchase the provided connectors at reasonable rates from us. 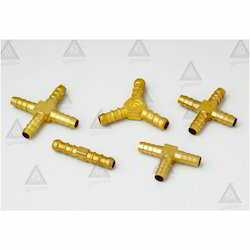 Since incorporation of our business, we have been offering premium quality gamut of Brass Plumbing Fitting - Male Connectors. These connectors are used to be installed in various in industrial and commercial appliances to ensure leakage-free joints. Manufactured by our deft professionals in tune with set market standards, the provided connectors are also checked on defined aspects to ensure their defect free delivery at clients’ end. Besides, we are providing these connectors at cost-effective rates to the patrons.